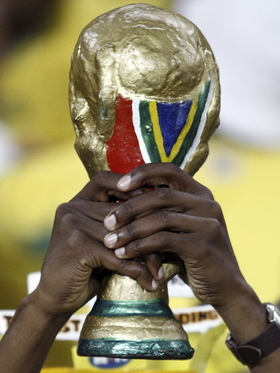 Mercedes aims to use the World Cup tournament in South Africa to attract younger buyers. BERLIN (Bloomberg) -- Daimler AG CEO Dieter Zetsche isn't just supporting Germany's soccer team when it takes the field for the World Cup. He's also betting on a victory for his Mercedes-Benz luxury brand. Zetsche is rolling out discounts and cut-rate financing packages in Germany as part of its most extensive promotion in 20 years for soccer's biggest event, while competitors BMW AG and Volkswagen AG's Audi balk at tournament-specific incentives. A discount of as much as 2,050 euros ($2,493) is available on the 38,000-euro SLK roadster, and the savings rise if Germany wins the competition, which kicks off June 11 in South Africa. The deals reflect the carmaker's need to broaden its appeal, whose drivers are about a decade older than Audi and BMW owners, according to market researcher Sinus Sociovision. Daimler's 2010 campaign involves traditional advertisements as well as online, print, and television media cooperation agreements, spokesman David Biebricher said. Germany hasn't won the World Cup since 1990, the year Mercedes began sponsoring the team. A special leasing offer pays Mercedes' customers as much as 319 euros if Germany wins the title at the July 11 final in Johannesburg. The country's odds of winning are 14-1, according to betting company William Hill Plc. Spain and Brazil, both with 4-1 odds, are the co-favorites. Mercedes is also offering zero-percent financing under the “dream selection” program, which includes the compact A- and B- class models, as well as the GLK SUV. The SLK discounts are for a package of options including larger wheels and black leather seats with red stitching. BMW, which doesn't plan any special World Cup offers, is loaning armored 7-series sedans and X5 SUVs to shuttle heads of states, said Guy Kilfoil, a BMW spokesman in South Africa. Audi, which sponsors German soccer champion Bayern Munich, won't roll out any deals or marketing campaigns linked to the tournament, spokeswoman Esther Bahne said. Volkswagen, Audi's parent, is taking a different tack. Europe's largest carmaker is offering discounts on the Golf and Polo cars, Tiguan SUV and Scirocco coupe under the “Team” campaign, featuring German players from winning squads in 1954, 1974, and 1990. The models have special features including shaded windows, new seat fabrics and parallel parking guidance. If anti-theft alarm systems and alloy wheels are added under the “Team Plus” program, buyers save as much as 2,600 euros, spokesman Enrico Beltz said. Mercedes this year has defended its position as Germany's biggest luxury brand, even as registrations through May fell 4 percent to 107,269 vehicles, according to the German motor vehicle office KBA. Sales of BMW and its Mini brand dipped 1.5 percent to 105,170 in the first five months of 2010, while Audi's deliveries slumped 8.2 percent to 89,503 cars and SUVs. Mercedes has boosted its World Cup promotions after an effort to enhance its sportiness with the signing of Formula One driver Michael Schumacher has stumbled. The former-Ferrari driver, who won a record seven Formula One championships before retiring in 2006, is in ninth place after seven of 19 races. Mercedes is sponsoring a fan Web site and has hired German soccer icon Franz Beckenbauer to promote the discounts in radio ads. The brand is also bringing out special edition postage stamps and showing matches at dealerships. The carmaker's Berlin showroom will have a 48-square meter (517 square feet) LED screen and space for 3,000 fans. “The promotion is very sympathetic and the partnership between Mercedes and the Germany's premium football team fits together very well,” said Thomas Rosier, managing director of dealer Autohaus Rosier GmbH in Oldenburg near Bremen, adding that he expects the offers to boost sales during the tournament.